For some homeowners, they’re initially concerned about how the rounded edges of a regular roof metal garage may stand out. When aesthetics are your primary concern, you should know about A-frame metal garages before settling for a wood-framed structure. The A-frame steel garages we sell here at MetalCarports.com match the look of your home while still offering the benefits of metal construction. You don’t have to choose between the look you want and the value of a metal garage thanks to the A-frame roof style. You may call it a boxed eave style metal garage instead, but regardless of name, the A-frame roof design remains the same. 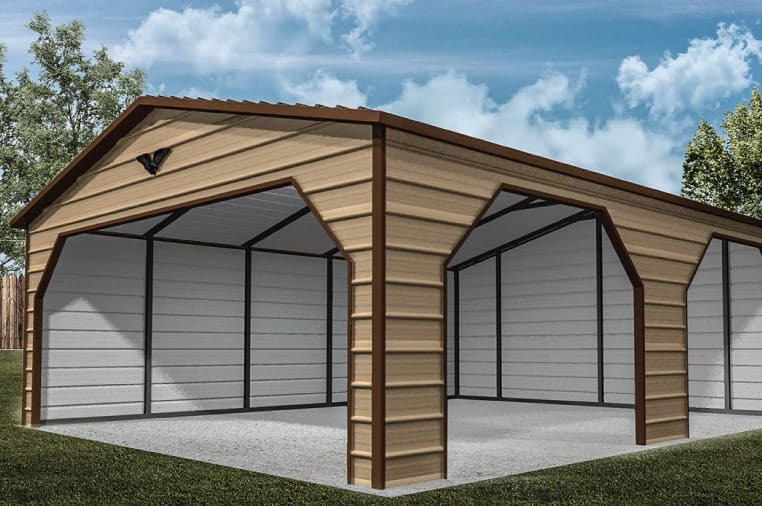 Instead of being supported by bent frames that give the garage a curved edge where the roof and wall meet, A-frame metal garages feature the A-shaped frame style instead that gives the design its name. Welded corners and brackets give the roof structure greater strength and weight-bearing capacity. This is essential in areas with winter snowfall and storm winds that can cause damage by lifting from below. Even with the protection of four walls and full enclosure, the frame style of the garage still matters when it comes to resisting serious damage. The actual roofing panels installed on the top of A-frame steel garages are installed parallel with the length of the roof, which means the raised ridges run horizontally. This installation uses less material than vertical roofing. The underlying framing is still stronger than what’s supporting the regular roof garage, creating a compromise balancing the best features of both vertical and regular roofs. Roof overhang on the eaves to direct water away from the walls and foundation of your new garage. Add french drains during the pouring of the foundation for even better drainage.